Should I tell them that I don’t even use the BestBuy Reward Zone since I signed up for it years ago? 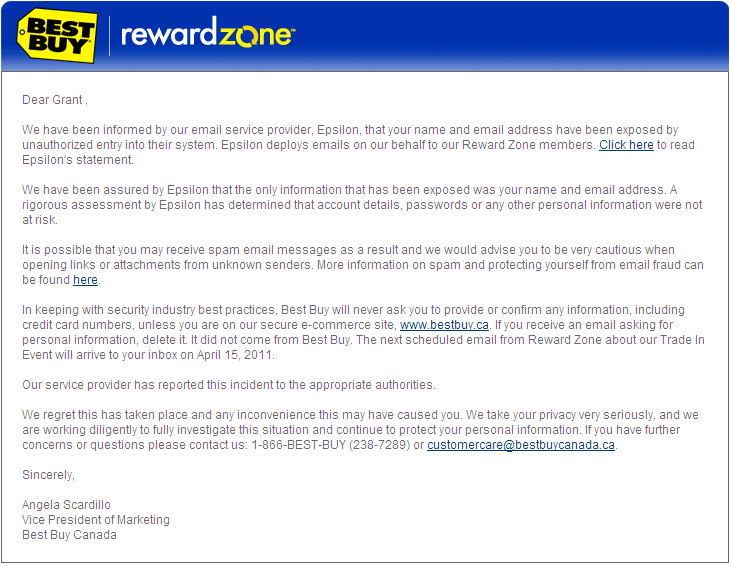 BestBuy Canada’s reward zone email provider Epsilon has a data breach and I received this email letting me know that “the only information that has been exposed was your name and email address”. My name and email address? Just the thing that companies covet and the life blood of the spammer. Thanks Epsilon. They do give you some sound email security advice about not on clicking links or attachments. BestBuy or any other reputable company / bank will never ask for credit card or any other information in an email. Here I was thinking that email spam was a thing of the past since Facebook has replaced the internet and all subsequent messaging tools. Oh well. I got this email too. Gift cards would really make it up to me.